For a long while, I've been contemplating a garden arch that will grace our front fence. There are 5 posts at the front fence, and I even thought of a series of arches from one end of the fence up to the other end. The reasons for not pushing with this elaborate plan are varied but the most compelling one is that it will block our view of passersby and houses across the street. Shown below is an example of a series of arches on the fence of a house I found near my daughter's university. There are 4 arches and they're made with wire mesh or steel matting. These arches are good for light to medium sized vines, just like the Golden Garland or Nong Nooch vines (Petraeovitex bambusetorum) that the owner planted. And so for now, we settled with the idea of a garden gate arch at the service entrance of the front fence. The idea was timely. There was a construction job at a house to our left. The foreman had a team of only around 5 people but they were working non-stop and had an impressive set of skills and tools. Originally, I wanted a design that looked like the traditional wooden country look with support braces. I also liked rafters with a curve design at both ends, much like what wooden rafters in traditional wooden arches would have. After much thinking, however, I realized that most vigorous vines that I've seen would typically envelope the vine structures their growing on. This reminds me of an aggressive thunbergia vine we removed. It then becomes pointless to have beautiful and intricate curves and angles on the arch because much of the vine's foliage would cover them. The diagonal support braces would still look nice, I thought. The foreman pointed out, however, that with the material we'll use, the braces wouldn't be needed at all. I concluded that, again, support braces would be needed if the garden gate arch was made of wood. Unlike commercial garden arches found on the internet, there are no side panels. It's just the two 3" x 3" posts supporting the metal trellis. It also looks cleaner that way. So for this project, the simpler the design, the better. I didn't think this would be an issue since I only considered metal as the only choice. Metal or steel, it's all I can think of for outdoor fabrication. Wood would be nice if you're after that old country-ranch theme. In fact, one house in the neighborhood has wood rafters in her garden gate arch. Although the arch is supported by big steel pipes, the angle bars used as beams are now slowly sagging under the weight of the heavy timber and her large Yellow Allamanda. 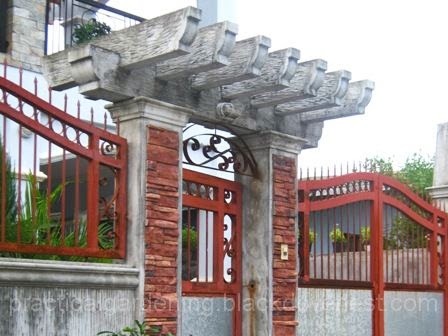 Another material that is suitable for the garden gate arch is concrete which, apart from metal, is termite-resistant. Here's one concrete arch from a nearby neighborhood that's massively built. But I have to say that this had to be done while the entire fence is being constructed. I can't imagine this garden gate arch being constructed as an add-on to an existing fence. Both arches shown above have good design elements. They certainly look good even by themselves. We've always wanted a vigorous flowering vine on our garden gate arch and so design elements at the ends of the beams or rafters were not a priority. The garden gate arch that was made for us has sleek clean lines yet very strong. 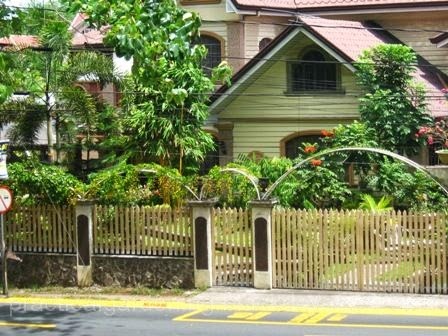 The flat trellis arch above the two posts has a frame made of 3" tubular steel pipe. The tubular steel pipe has a thickness of 1.5 mm. Inside the frame is the trellis lattice made of 12 mm steel round bars crossing each other spaced at 8 inches from each other. Each of the garden arch posts is made of two 3" angle bars welded together. The two posts were welded with the reinforcement bars inside the concrete posts. They were later filled with concrete. Filling them with concrete prevents rain water from getting inside the posts that might end up in rusting. It also prevents insects like ants from nesting inside. I can't imagine strong typhoons easily knocking down this vine support structure even with a vigorous vine growing on it. Here's a view of the garden gate arch as seen from the outside. Another consideration for the construction of the garden gate arch is its dimensions. Notice that this garden gate arch sits on top of the concrete posts of the service entrance that leads outside to the street. Not too high that a possibility of dangling overhead wires may touch it. Not too low that those passing through the service entrance would hit the top of the arch with the top of an open umbrella. I've seen commercial arches on the internet with heights ranging from 7 feet to 8 feet. The top of our garden gate arch is at 7.7 feet high. Our house is much higher than street level and from the outside, the arch looks very high. Not too wide that foliage of vigorous vines overreach into the driveway. Distance between posts should not be too narrow that they will not allow an open umbrella to pass through. The posts our gate arch were centered on the top of the concrete posts and are 4 feet apart. The overhead arch trellis is 1.5 meters wide. Not too deep that, even with a ladder, I can't reach above the overhead trellis especially when pruning branches on top. Deep enough that the vine's foliage on top can provide shade for someone standing at the service entrance. Deep enough to allow the growing vine to flourish on top of the trellis. The flat trellis on top of the two posts of the garden gate arch measures 1.5 meters (width) by 1 meter (depth). It has a total height of 7.7 feet from the ground. The structure is all steel with concrete filling the hollow steel posts. The only issue with the paint is color. The foreman suggested black to match the color of the gate and front grills. And so it was painted black. But it looked dark and plain-looking. The other colors I considered was gray, white and maple. It was maple (a shade of brown) that seemed sensible because it matched the color of the house's windows. After it was painted, the structure looked like it was made of wood. 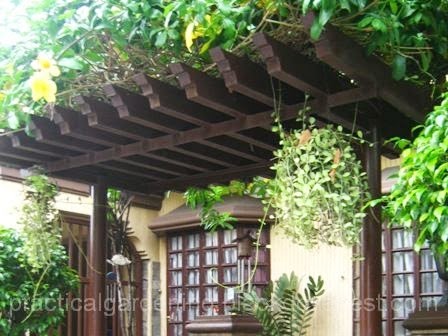 We were so happy with the result that we contracted the same team to build a garden pergola or arbor for us.